With the volume of calls we receive on a daily basis, the developers at Armor Techs needed to make a quality of life shift to using a softphone, or a phone that makes calls through our computers. With this switch in mind, we also needed to get some new hardware-new headsets with high-quality audio streaming and crystal clear audio capturing. We decided to test a few different brands and models of headsets, with the Razer Kraken USB Headset being one of them. We've had the opportunity to use this headset for several months now, and the results are exactly what we wanted. 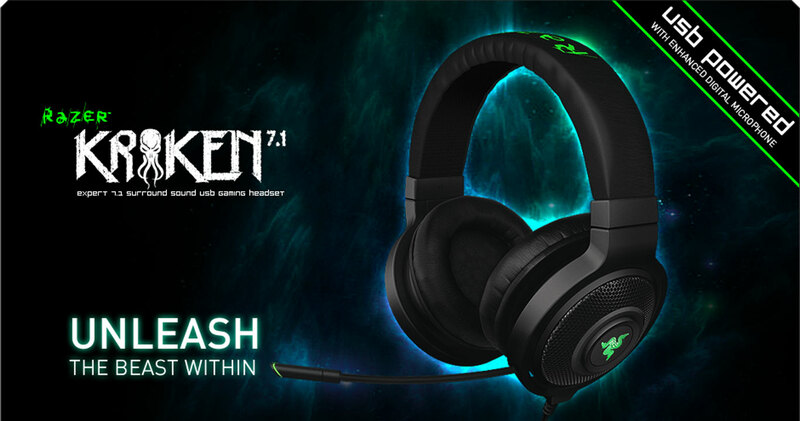 The Razer Kraken USB Headset boasts advanced 7.1 surround sound capabilities with Razers own surround sound engine, Synapse, driving the process. Bear in mind that this headset was designed with gaming as its core intent-so immersion and clear audio was always the end goal, but the headset definitely lives up to that. With Razer Synapse, you also have the ability to customize a specific profile for each application to fit the sound to your ears-from surround channels to bass levels and even incoming voice audio-everything can be fine-tuned to fit your specific needs. On top of the audio quality and manipulation, the Razer Kraken USB Headset ships with a unidirectional analog microphone. Razer boasts that this headset, "... leaves no room for miscommunication..." and for the most part, they aren't lying. In our experience, this microphone can pick up voices from almost any angle-but only if the path between the source and the microphone are clear. Even a slight barrier between the two, and the audio becomes significantly harder to understand. I know this may seem intuitive, but this even includes when the ear cup with the microphone is moved off and behind the ear, tilting the microphone in a direction that is slightly behind your face. Other than this small directional issue (which may be intended design, but feels like it is an issue), the microphone transmits clear, concise audio without any issues and with very little interference from echo, popping, etc. The overarching feature that most casual or professional users are interested in a headset always seems to come down to the comfort level for short and extended use periods. We can attest that the Razer Kraken USB Headset was designed with your comfort in mind. With a fully padded and adjustable headband, the headset sits comfortably on the top of the head and allows for 10 different positions for each ear cup. The ear cups themselves are plush padded and are over-the-ear closed cup style, meaning your ear rests comfortably inside of the ear cuff, and because of this the noise-canceling is excellent. The way the headset is designed leads to a little bit of pressure on your head to hold it in place but not nearly enough to cause any problems, in our experience. Overall, it is one of the most comfortable headsets anyone at Armor has had the opportunity to use, especially for the fairly inexpensive price point. Razer Synapse Drivers allow for in-depth audio configuration. Crisp audio transmission through microphone. One of the most comfortable headsets for the price point. Too much bass, too much volume leads to quick declines in audio quality. Lack of RGB Lighting on the ear cuffs (which Razer implemented in newer models) is unfortunate, but it is not necessary. Minor amounts of pressure on the sides of the head when wearing for extended periods. In conclusion, for the casual/professional non-gamer, or a gamer on a budget, this headset is definitely a top choice when it comes to getting the best "bang for your buck." With the comfort level you get with this headset, you won't have any complaints with extended use. The audio quality is good, and for the price we're not sure you will find a better headset. We would recommend the Razer Kraken USB Headset as an everyday tool to improve your workflow. If you'd like to find out more for yourself, visit The Razer Website to see additional technical specs or to purchase the headset. The price point of $60 seems to be the same across the major vendors-with the real price difference being if you are willing to pick up a refurbished version, which Newegg offers here.